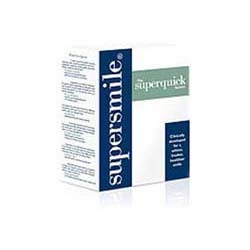 Supersmile Super Quick: Does Supersmile Super Quick Work? The Supersmile company produces a wide range of dental products but seems to specialize mainly in teeth whitening treatments. There is a good amount of information available about Supersmile on their official website, including an introduction to Dr. Irwin Smigel, the company founder who is also known in the industry as the ‘father of aesthetic dentistry’. Not only was he a pioneer in the development of the bonding technique, but there is also an industry award named after him. Supersmile has an impressive testimonials section which includes statements from past customers, celebrities, such as Kelly Ripa and Ivana Trump, and even dental professionals. The site has a good FAQ section that covers information on all the products available and the ingredients used in the treatments. In addition to this, there is a separate section that provides links to media (People, Shape, Redbook magazine etc.) that have featured articles about Supersmile products. Unlike many similar brands available, Supersmile shows complete results of how it has performed in clinical studies, and how it compares to other whitening products on the market. The Supersmile Super quick kit is a 6 piece product that enables the user to receive a full dental hygiene treatment. The teeth whitening system consists of a tube of accelerator (containing carbamide peroxide) and a tube of Supersmile toothpaste. In addition to another tube of the paste, the remainder of the kit contains floss, single dose mouth rinses, a specialized toothbrush and tongue cleaner. The product list on the Supersmile website can be a little overwhelming, but detailed information on the Superquick kit can easily be found on independent websites. Unfortunately there are no instructions regarding how long to use the whitening kit or exactly how it works, although it is known that it does not use any kind of whitening tray. The cost for the Superquick kit is approximately $80.00, although this may vary depending on the retailer. Supersmile Super Quickappears to be a well-respected and widely used brand that is popular with celebrities and regular customers alike. Although the precise application process is not clear, it is a good alternative to consumers who do not like using the more traditional ‘tray’ system or adhesive strips. Despite the relatively high cost of Superquick, the fact that it has received positive feedback and obviously works to a certain extent, means that it would be money well spent.